For release at the end of July is 'The Sun Sessions', a compilation of Elvis Presley's recordings at Sun Studios in 1954 and 1955. The album was origianlly issued by RCA Records in 1976 and featured liner notes by Roy Carr of the New Musical Express. It had been issued and charted as The Sun Collection in the UK the previous year. The album features most of the tracks recorded at Sun studio by Sam Phillips, the head of Sun Studios. Phillips signed Presley after hearing a song that he had recorded for his mother on his birthday. It includes 'That's All Right' one of the few recordings regarded as 'the first rock and roll record'. Phillips said that Presley was rehearsing with his band, Scotty Moore and Bill Black, when Presley started singing the song, a blues song written by Arthur 'Big Boy' Crudup. Phillips said that the version of the song was what he was looking for when he signed Presley, and turned the tape recorder on. Many believe rock & roll was born on July 5th, 1954, at Sun Studio in Memphis. Elvis Presley, guitarist Scotty Moore and bassist Bill Black were horsing around with 'That's All Right, Mama', a tune by bluesman Arthur 'Big Boy' Crudup, when producer Sam Phillips stopped them and asked, 'What are you doing?' 'We don't know', they said. Phillips told them to 'back up and do it again'. The A side of Presley's first single (backed with a version of Bill Monroe's 'Blue Moon of Kentucky'), 'That's All Right' was issued by Sun on July 19th. It may or may not be the first rock & roll record. But the man who would be King was officially on wax. Bridging black and white, country and blues, his sound was playful and revolutionary, charged by a spontaneity and freedom that changed the world. 'It's the blues', critic Greil Marcus wrote in his classic book Mystery Train. 'But free of all worry, all sin; a simple joy with no price to pay'. Presley released four more singles on Sun – including definitive reinventions of Wynonie Harris' 'Good Rockin' Tonight' and Junior Parker's 'Mystery Train' – before moving on to immortality when Phillips sold his contract to RCA for $35,000. 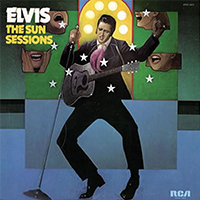 Incredibly, it took more than 20 years for Presley's Sun output to be properly collected on a 1976 LP – which has since been superseded by this 1999 double-CD chronicle of the King's beginnings at Sun. It collects everything he cut at the studio, including alternate takes and the 1953 acetate he recorded as a gift for his mother as a shy and awkward recent high school graduate. No thanks. "Elvis At Sun" is the cd to get. Oh my....., already have these on CD in so many forms, like many of you. I also have the original vinyl and cassette. I will pass on this one. How many times do Elvis fans have to pay for the same material? RobIreland and Steve V, you are quite right about the aweful cover. By now there are so many pictures around that one could expect a better cover. No need to stick to the original cover. Arguably the worst , unimaginative cover ever for a full priced Elvis album. A 1968 TV comeback special wiggling cartoon image for these groundbreaking songs was an insult to the buyer and Elvis fan. By contrast, the UK version had one of the best covers ever. Hello. The tracklisting cites 16 songs, but the blurb refers to: "this 1999 double-CD chronicle". If this is another dismal public domain lash-up, the producers wouldn't be able to release the out-takes and rarities that were released late in the day or the superior 'Elvis At Sun' masters. So I think the modest tracklisting is probably right, and the blurb has been cribbed in error from the catch-all 1999 Sun-era CD 'Sunrise'. Another howler. I remember buying this LP back in the day. Played it to death. Still own an un-opened copy. Love the cover. This almost certainly is a PD reissue. No thanks.